FREE Women's Mirna Shoulder Purse! You are here: Home / Great Deals / Christmas Deals / FREE Women’s Mirna Shoulder Purse! FREE Women’s Mirna Shoulder Purse! 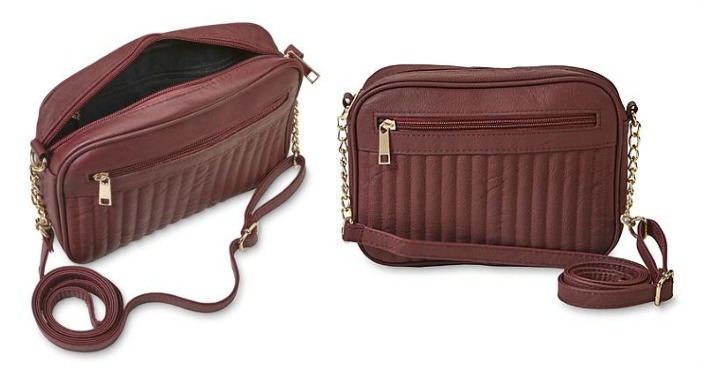 Sears has this Women’s Mirna Shoulder Purse (red only) on sale for $9.99 and you can get back $10.09 in Shop Your Way points, making it FREE! The women’s Mirna shoulder purse goes anywhere with ease. This structured synthetic leather bag gets chic texture from a quilted panel in front. Goldtone chains add sophisticated gleam to the adjustable shoulder strap. A top zipper reveals a medium interior outfitted with a zipper pocket. Final: FREE PLUS FREE shipping on orders over $49!